Hacienda de la Tortuga is an all suites beachfront condo complex. 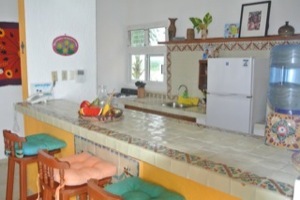 The suites are individually decorated in a modern Mexican style with original paintings. All suites are bright with lots of daylight, and have a terrace with a spectacular ocean view. Hacienda de la Tortuga suites have the amenities of a condominium, but with the added benefit of personal services. The kitchen allows guests to have meals in when they choose, saving money and time. And the self contained condominiums offer space and privacy for relaxing and spending time with friend and family. Daily maid service is a big plus for people looking for a hassle free vacation. Located on the beach in Akumal, this all-suites beachfront condo has oceanview rooms, pool and modern amenities in a seaside resort one hour from Cancun, Mexico. Better than any Akumal hotel! One of the few Akumal condos on a sandy beach and a favorite Akumal vacation rental for its beach location and spacious beachfront rooms in Akumal Mexico.